Grooming Like an Old-school Pro. Horses have been around for a lot longer than our modern conveniences like horse vacuums and show sheen spray. While we can be grateful to have access to these conveniences, not everything we use today is actually helpful or beneficial. What did experienced stable hands do in the ‘old days’? Sometimes, it’s the simple ‘old-school’ solution that gets the best result. Horses were used in different settings throughout human history. ‘Best practices’ in grooming were developed and maintained mostly in the cavalry—as there was a strict need to maintain the horses’ at their best possible health and condition. Read more about grooming at Fort Scott here. I extracted these tips from different sources, books and cavalry manuals. Enjoy! Apparently something that makes the horse hoof shiny. Cut an onion into half and rub the clean and dry hoof with the raw onion before entering the show ring. It will provide shine without the unwanted side-effect of attracting sand and dirt. Laurel oil (bay leaf oil) has been a staple in hoof care for centuries. The thrifty groom would massage the oil into the coronet band, then sparingly spread a thin film over the rest of the hoof wall. Then hoof treatment was applied to the collateral groove and the sole of the hoof, never the frog! The hot and sweaty horse appreciates having his eyes and nostrils cleaned with a damp cloth. Then 10-15 minutes of calm walking in hand, in winter or cool weather covered with a simple wool blanket. Follow up with a vigorous rub down with a bunch of clean straw to dry the coat further, then brush the coat smooth with a coarse natural brush.us. Do we really need all the chemicals and gadgets that fill up our grooming box today? Looking at old sources it becomes clear. A few good-quality grooming tools and the right technique (also read “4-Step Grooming“) is enough. The knowledgeable old-school groom rarely combed a mane! Instead, the mane would be finger-combed, then brush the mane until smooth and shiny. Only then would the groom use a wide-toothed comb and—if desired—part small sections and braid loose braids. Ready to pass inspection! Fun fact: The German cavalry collected all mane and tail hairs in special bags. These were then picked up periodically by the mattress maker! Yes, fine mattresses were made of horse hair! Wherever there are horses, there will be flies… Besides cleanliness, the old-school barn master prescribed a natural ally in the war against the buzzing pest: swallows. Encourage swallows to nest in your barn and you will keep the fly population low. If you cannot convince the swallows to nest in your barn, try a ‘spiked lemon’. Spike a lemon with cloves and hang it up in your barn. After cleaning saddle, bridle & other leather accessories thoroughly with saddle soap, the old-school groom would not let the leather dry out completely but instead apply leather conditioner when the leather was still somewhat damp. After letting the conditioner soak in, remove excess fat with a wool cloth, easily made by shrinking an old wool sweater in a hot wash cycle. In order to remove caked on dirt and sweat before cleaning the bridle with saddle soap, take the bridle apart and soak it for a few minutes in lukewarm water with a squirt of ammonia.Be sure not to forget the bridle in the bucket! Remove after a few minutes. Never wash the fetlock when washing the hoof. If the fetlock got wet, dry it off thoroughly. While the old school groom had a number of tricks in his bag, there were certain ‘Do Nots’ that made sure the groom would not unintentionally hurt the horse. Do not use a metal curry to curry the entire horse. Only use it to loosen caked-on mud or sweat on muscled parts of the horse’s body. Never use a curry on bony parts or on hairless areas. Beyond that, use the metal curry ONLY to clean the brush during and after grooming. Do not comb a tail! Only finger-comb, then brush with a medium-stiff root brush. The old-school groom would NEVER comb a tail. Instead, the groom would use his fingers to part the tail hair and remove larger pieces, than brush the tail clean with a medium-stiff root brush. Last not Least: A Tasty Snack! The groom in old times provided his horses with tasty branches from fruit trees, birch trees and hazelnut bushes. This was supposed to be healthy and good for the teeth. If you’d like to take it up a notch, soak some bread in beer, a snack that was (or still is…) supposedly popular in some parts of Germany. (Note: This tip is provided for entertainment purposes. If you would like to try this, please check with your vet first! I like the simple old-school grooming concepts and prefer to groom in this more fun, efficient, and natural way. If you feel the same, you can get my old-school grooming poster “4-Step Grooming” by sending an email with the subject ‘old school grooming‘. I will then send you the pdf, which you can print out and hang up in your barn! Hope you enjoyed this article. Be in touch with question! Can a Grey Horse Shine? A shiny white horse – only in our dreams? 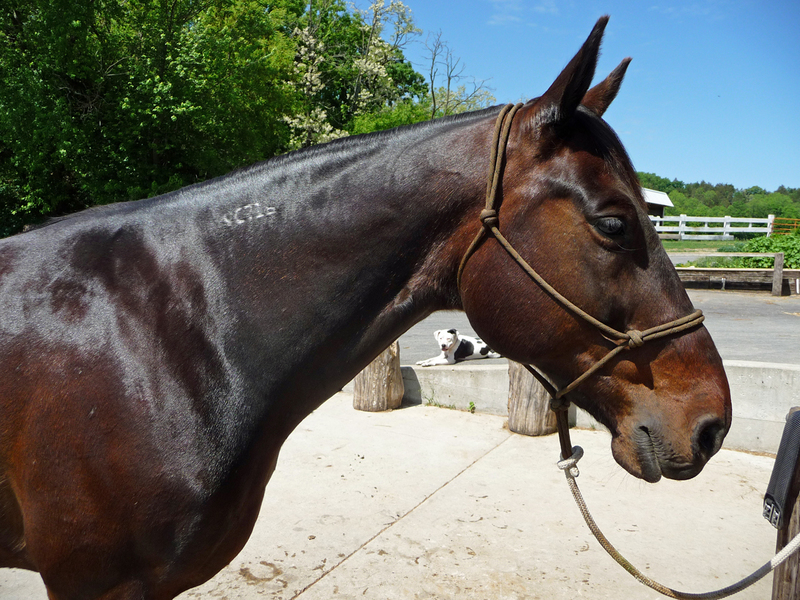 A shiny coat – (almost) every horse owner dreams of a shiny coat. Whether we look at old paintings or photographs, show footage or horses in our environment, a horse with a shiny coat stands out and has always been revered as a symbol for vibrancy and health. Most of the time, we associate a shiny coat with certain coat colors, especially black, bay, or chestnut. There is nothing like the glow of a dark bay or coppery chestnut horse! But what about our white or grey horses? Can we produce shine in a grey or white horse? People and horses are mammals, so genetically and as it pertains to hair, the biochemistry is basically the same. The article further explains that certain genetic aspects seem to be associated with one hair color or another, which explains the whole ‘method in the madness’ of breeding. But does the hair of dark horses actually have a component that creates ‘shine’? No. The simple fact is that smooth, dark surfaces play with light in a different way than smooth light surfaces. Think of a white car and a black car, both equally clean and polished. Which one will seem more shiny? And here comes the deciding factor: Smoothness and cleanliness. If the surface is smooth (again think of a car) versus textured (think of a wooden picnic table), there will be more light reflection. So the key is to create a SMOOTH & CLEAN surface. Just like in us humans, only a healthy horse will have a healthy coat. Feeding the right amount of essential nutrients and healthy oils will be the precondition for a smooth, healthy, vibrant, and shiny looking coat! Shine on your white or grey horse will not be as obvious. It will be a healthy glow and glisten when the light falls in just right. Just because light surfaces reflect light different than dark. The challenge with white and grey horses is that manure and grass stains show up more than in their darker herd mates, which immediately distracts from an overall good-looking, healthy and clean coat. We will talk more about how to tackle stains in white and grey horses in a different post. The glow and glisten of a healthy, clean, light-colored coat. Yes, white and grey horses can shine! But their shine will not be as obvious as that of a darker horse since dark surfaces reflect light differently than light surfaces (again, use the car example). The key to a vibrant looking white or grey horse: Good feed, cleanliness, and proper grooming techniques! Or: Is there something I don’t know yet? This summer, I received the generous offer to review a book. This happens every now and then and – just like I would expect from someone reviewing my work – I am dedicated to an honest opinion. ”. There must be hundreds of those books on the market, I thought, and did not have great expectations. (A horse owner’s) Life, however, can be full of surprises and this was a positive one! What sounds like a drag to read through, is actually a very well presented wealth of really good, imaginative, practical and downright frugal ideas, covering anything from grooming over tack care and facilities to riding and pasture. Granted, some of the tips may not be down your alley (not wanting to create a hand-made net?) but many will. One I really liked and that alone would make it worth the purchase: Easy to make stirrup covers that will prevent the stirrups from scratching up your saddle when you put it up. It’s not rocket science, but the point is, I never had the idea! “Horse Owner’s Essential Tips will quickly find a place in the stable office”. Yes, indeed. It’s easy to read format and delightful illustrations make it wonderful to have at hand for perusing when you only have a little time to kill (waiting for the vet, for instance). In those 10 minutes of browsing through the book, something will catch your eye that will make a difference to your (horse) life, all while enjoying a well-illustrated book, written in a light and easily digestible style. It is now a part of our barn library to be enjoyed by all. Oil to ‘cure’ chestnuts: Apply sunflower or olive oil to large, dry chestnuts daily until they fall off on their own. (I might add: Apply once or twice weekly afterward to keep them from growing back.) This is a low-cost, easy solution to a common unsightly problem. Secure blanket clasp: Many horse owners blanket their horses in the winter, only to find that their expensive blanket will not stay on the horse. The problem: The clasp keeps opening. Meyrier suggests an easy solution: Use a rubber gasket such as found on certain beer or lemonade bottles to prevent the clasp from opening. A nifty illustration shows how it’s done. An enjoyable read, great to keep in the barn or take along on a show or horse camping trip. A chock full of innovative, imaginative and often frugal and funny tips and tricks to make your horse life easier. A useful addition to any horsey library. On my personal list of horse friend Xmas gifts! in your shelf or on your Christmas list. It’s a keeper! It’s Shedding Time! What’s there to Know? Twice every year your horse changes his coat—from thin summer coat to thick winter coat and vice versa. In the spring, our horses are shedding their thick coat and horse owners are working hard with various tools from massage curry , over shedding blade to shedding brushes with soft brass bristles to help their horse through the transition. But is that enough? Is hair all there is to shedding? Not at all. As the days get longer, your horse’s organism receives signals to change the coat—and body and metabolism are also experiencing significant changes. The horse has to produce a large number of proteins in order to create the new coat. This is an enormous feat!
) help your horse grow a healthy new coat. Calculate the right amount and follow manufacturer’s recommendations. Supporting your horse with the right nutrition can help your horse shed his coat. If you want to see a really shiny, smooth summer coat, replace harsh shedding blades – which can scratch the skin, damage hair follicles and roughen the soft hair of the new summer coat – with a firm brush or better yet a 50% brass bristle brush. To help your horse shed his coat without rushing the process, use a 50/50 brass bristle brush – such as the HorseHaus ‘Curly’. This brush will gently remove the soft undercoat that is so hard to grab with a shedding blade. At the same time, it removes dirt and dander and leaves the coat clean. 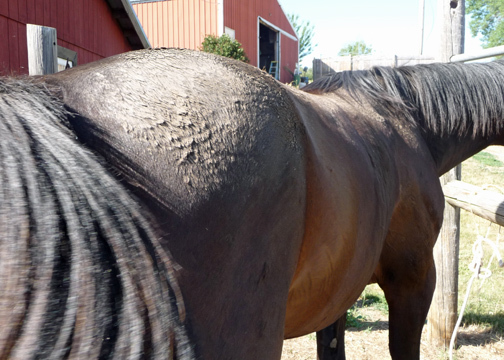 If possible, ask a little less of your horse during shedding time. 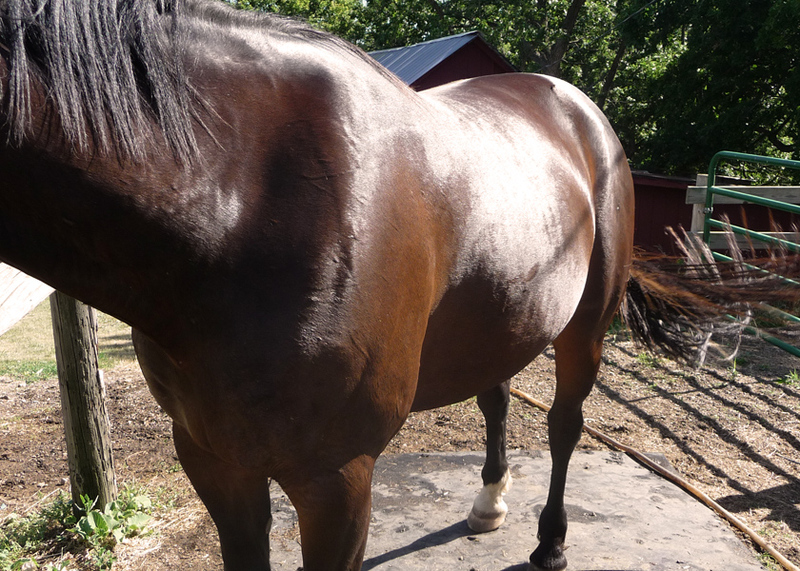 Your horse’s systems are already quite strained through the effort of changing coats and metabolism. If your horse is a bit on the lazy side during coat change season, let him get away with some of that and lighten the work load, if possible. In short: When your horse is shedding the winter or summer coat (yes, that needs to shed, too) and grows a new coat, there is much going on ‘behind the scenes’. Taking this into consideration during coat change time will make a big difference to your horse. Be well and enjoy your horse! What did experienced stable hands do in the ‘old days’? What can we learn from them? Treating a horse’s hoof with a hoof conditioner with Bay Leaf Oil. The hot and sweaty horse appreciates having his eyes and nostrils cleaned with a damp cloth. Then 10-15 minutes of calm walking in hand, in winter or cool weather covered with a simple wool blanket. Follow up with a vigorous rub down with a bunch of clean straw to dry the coat further, then brush the coat smooth with a coarse natural brush. The knowledgeable old-school groom never combed a mane! Instead, the mane would be finger-combed, the dandruff on the crest would then be brushed off with a horse hair finishing brush, parting small sections with the fingers, and then the groom would smoothen the mane by brushing. In order to remove caked on dirt and sweat before cleaning the bridle with saddle soap, take the bridle apart and soak it for a few minutes in lukewarm water with a squirt of ammonia. Be sure not to forget the bridle in the bucket! Remove after a few minutes. Last not least… a tasty snack! The old saying ‘no hoof no horse’ gains special significance in the winter, when elements, cold temperatures and wetness can contribute to hoof decay. Here in the Midwest, this is a big concern. The horse’s hoof is the equivalent of the last two digits of the human middle finger, encapsulated by horn layers. When caring for our horse’s hoof, we are concerned with the outer layers: the wall, the sole, the frog, and also the coronary band. The coronary band: The equivalent of our cuticles. This is where hoof growth starts. The wall: The wall is between 5 and 10 mm thick and consists of three layers. The outer layer of dense horn acts as a barrier to the inner layers. If the outer layer is healthy and maintained properly, it prevents dehydration of the inner layers. The sole: The sole can grow up to 10 mm thick. Its Keratin* is more easily worn down than that of the hoof wall. The frog: Keratin in the frog and bulb is also softer than in the hoof wall. With every step, the horse’s weight expands the frog, which in turn presses the hoof wall outward. 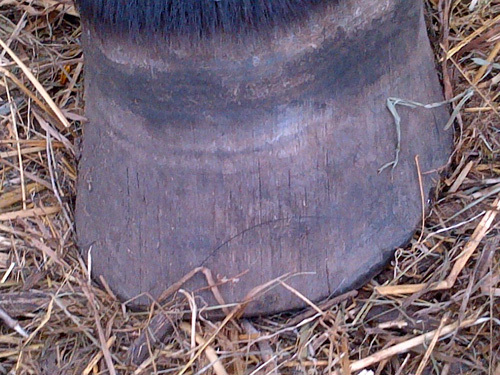 This is called the ‘hoof mechanism’, a healthy and necessary function of a natural hoof. The wall should stay hard and strong but resilient and not brittle. The sole should be dry and somewhat flexible, but not crumbling or too dry and hard (think expansion). The frog needs to be elastic and resilient but not soggy or rock hard to maintain a healthy hoof mechanism. Is the hoof soft and brittle? Is the hoof hard and brittle? Is the hoof dry and rock-hard? This is what is looks like: A soft brittle hoof will visibly disintegrate. Pieces of horn break of the hoof wall. The hoof is described as “crumbly”. If shod, the farrier will have a hard time keeping a shoe on this hoof. Causes: Too much exposure to wetness without proper ‘barrier’. Exposure to manure/urine/wet bedding/mud. Hoof horn possibly genetically somewhat soft. Repair: Avoid wetness! Dry bedding, dry lot without puddles. Clean hooves thoroughly with water and brush, dry with a towel, then treat hooves daily with a hoof ointment or oil without petroleum-based ingredients (no vaseline). Maintain: Keep horse’s environment dry and clean hooves daily. Treat several times per week with a natural hoof treatment. 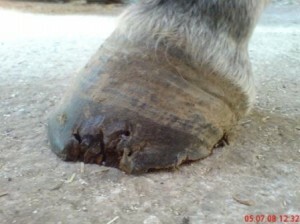 A dry and brittle hoof with vertical cracks. This is what it looks like: A hard and brittle hoof has lost its resilience and elasticity by allowing too much of the moisture of the inner layers to evaporate through the outer protective layer, mainly the hoof wall. It will show up as a hard, dry looking hoof with vertical cracks. Causes: The outer layer of the hoof wall and sole does not act as a protective barrier and is stripped of its natural defenses. Harsh hoof treatments, harsh chemicals (shampoos, soaps), very dry environmental conditions, very cold environmental conditions. Hoof genetically predisposed to hardness/dryness meets unfavorable conditions. Repair: A horse with a dry and brittle hoof can benefit from a bit more moisture. Standing in a puddle, hosing, soaking, spraying CLEAN bedding with a little water. Clean hoof daily with water and hoof brush, then dry thoroughly with a towel and apply a moisturizing, protective hoof conditioner (NO petroleum-based products!). Hosing the hoof can help moisturize. Maintain: Clean and condition daily or at least several times per week to maintain the outer layer’s ability to lock in moisture. Monitor the hoof for signs of dryness and soak or hose when needed. This is what it looks like: Dry and hard hooves (hooves like a ‘rock’) are often mistaken for healthy hooves. If you examine your horse’s hoof and the sole and frog present rock-hard and inflexible, this is–while it looks so clean and healthy–not a good thing when we think about the hoof mechanism. A healthy hoof mechanism requires a resilient and elastic frog and bulb and some elasticity in the sole and wall. Causes: Horses with dry and rock-hard hooves are mostly kept in clean stalls, are shod, and generally well cared for. Genetics also play a role. That said, this is a clean, but not a healthy picture! Cleaning feet regularly is important. Repair: Evaluate the horse’s trim. Is the horse carrying weight on the hoof wall, the bars and the frog? If not, consult with your (or another…) farrier. A shod horse can still have a healthy hoof mechanism to some extent! If possible, apply a nourishing hoof conditioneron the clean hoof several times per day. Spray clean bedding with a little water. 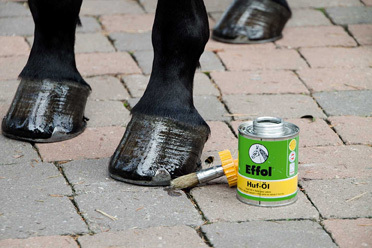 Maintenance: Clean hooves daily and apply a nourishing hoof oil several times per week. Soaking in water, standing in puddles, turnout in pasture and hosing can support hoof health for a hard and dry hoof. To provide some moisture for dry hooves, cut a thick piece of felt in the shape of your horse’s hoof, soak it in water, place it in a horse boot (Easy Boot Trail, for example, or any therapeutic boot) and let the horse stand in it while you are grooming. Laurel oil has been a staple in old-school hoof care for centuries and is ideal for the maintenance and to support growth of a healthy hoof. Massaging the oil into the coronary band and then down will improve the effect. You can use an old tooth brush to massage the oil into the hoof. Nutrition – Adequate nutrition, roughage, minerals/vitamins, balanced rations are crucial for healthy hoof growth. Genetics – Certain breeds tend to have certain types of hooves or typical hoof problems. Individuals also have their special genetic ‘hoof make-up’. Again, there is no one-for-all solution! 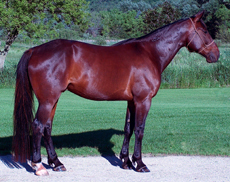 Laminitic changes and other health factors – The insulin-resistant horse, the Cushings horse, a horse that has foundered in the past or is prone to laminitis is also a horse with possible hoof problems. Consult with your vet and farrier, care and hoof treatments can support your horse but not ‘fix’ the problem. Manure – manure disintegrates the outer layer of the hoof and can lead to brittle, cracking hooves or to fungal/bacterial conditions. Keep the horse’s environment as clean as possible. Trim/shoeing – consult with your farrier to determine the best possible trimming/shoeing solution for your horse. If your farrier applies a ‘one for all’ solution, look for a different farrier. Weather/environmental – While you cannot change the weather, you can change the way you maintain your horse’s hooves (above). Exercise – The ‘equine couch potato’ will have a hard time maintaining a healthy hoof. Adequate exercise is one of the important factors when it comes to healthy hoof growth. Maintenance – Clean hooves and apply a conditioning hoof care treatment. This is the equivalent of using hand lotion, cuticle oil, hair conditioner, etc. It is not the ‘fix all’ but a necessary component of good care. A healthy hoof takes care. Emergency grooming routine: From mud-cake to shine in 3 minutes! or event and found your horse looking like a mud-cake? Did you ever have to have your horse look his best in a very short time? No problem. With the right tricks and grooming tools, you can groom your horse from (dry) mud to shine in 3 minutes (per side). My Paladin had fun! And now I have 7 minutes to make him look presentable! …when the trainer is due to arrive in 15 minutes…!! Curry your horse all over with the soft rubber curry, knocking out the curry a few times to remove the dirt from the curry. Work from head to tail, include the legs. Don’t overdo it, just loosen all the dirt and move on. This is not the time to do a thorough job. You got 30 seconds! Use your flick brush to remove most of the dirt by brushing in long strokes from head to tail and down the legs. Clean the brush on the curry 2 or 3 times while brushing. You got 1 minute! Wet your large clean sponge with clean water and squeeze until the sponge is damp. Take your finishing brush in your brushing hand, the sponge in the other hand. Brush brush vigorously with long strokes from head to tail, stroking your finishing brush against the damp sponge every 2 strokes or so. You got 1 minute! Use your soft clean rag to smoothen the coat and remove remaining dirt, stroke in the direction of hair growth with medium pressure from head to tail. You got 30 seconds! Take a look at your horse and remain in awe of your grooming skills for approx. 30 seconds, then clean the sponge and do the other side. Once done, follow up with the rag on the first side again. Now get that saddle on and ready for your lesson! Before and after, all on one horse. Please remember: This is a great method when time is of the essence but will not thoroughly clean your horse. For every day application, get back to a mellow, thorough grooming technique that both you and your horse will enjoy. For a more thorough day-to-day technique, read ” How to groom your horse to shine in 4 easy steps “. Anyone who embarks on horse ownership knows how confusing the multitude of seemingly shine and gloss producing products, spray, shampoos and gels can be that are the staples of any well stocked tack shop or horse/farm supply store. From detanglers – leave in and leave out – over lotions, potions and even specialized supplements, there is no end on how much money you can spend and how many different products you can apply to your four-legged furry friend in order to produce show-ready shine. Or is there? Let’s just rethink and take a brief trip through time. When I got started in horses in the 1970’s and groomed 5-10 horses every day plus show grooming on weekends, there were two elements that determined how shiny and well groomed your horse would look: your determination and elbow grease and a good quality brush. The End. (Not) Admittedly, there is also a certain level of technique and skill that – while easily learned – is key to getting it right. A word of caution: Throw out your plastic or metal curry combs and replace with a good quality rubber massage curry and a cheaper regular rubber curry. Plastic curry combs can create micro abrasions on the hair, strip the hair of it’s natural oil coating (loosing that shine right there! ), create micro scratches on your horse’s skin which leave him prone to skin infections and damage hair follicles. So, out with that cheap plastic curry at once! Metal curries are unsuitable to rub a horse’s sensitive skin and hair for the same reason. There is never a good reason to use either one of these monstrosities of grooming tools. A massage curry increases the blood circulation of the skin, helps relax the tiny erector muscles that are connected to each hair follicle (aha! 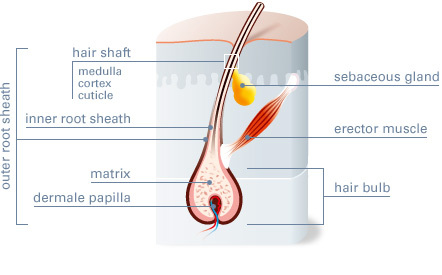 relaxes muscle = flat hair = shine…) and brings dirt and debris up from the skin in a gentle way. You can be sure not to do any damage, even when used around bony landmarks like points of hip or hocks. How it’s done: Start behind the poll and curry your horse in a circular motion from head over chest, shoulder, back, belly, hind end to hocks. Don’t work the curry from knee or hock down. We’ll get to that later. Do this on both sides of the horse. Your goal: Massage the skin and bring up all the dirt and move it to the surface. Flicking is a sort of sweeping hand motion in short strokes to further bring up more dust, debris and dander from the horse’s skin up to the surface of the coat. It also serves to distribute the oils on the skin over the hair (shine alert!). 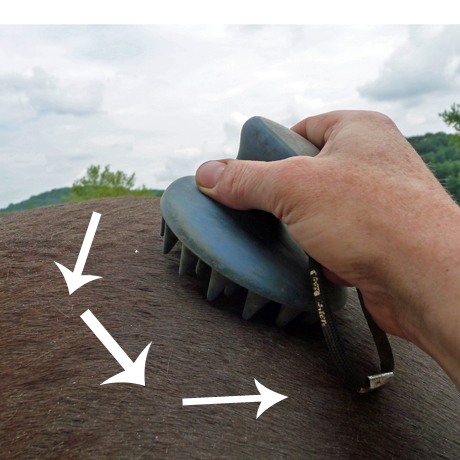 In order to perform this flicking action properly, you need a proper flicking brush. This is a medium stiff brush made of NATURAL materials that does not bind the oils to the brush, but rather distributes them evenly. A synthetic brush will bind the oils to the brush, which then in turn bind dirt to the brush which you then reapply to your horse. (Defeating the purpose of grooming.) Synthetic brushes should be called ‘Anti Shine Brushes’ for this reason. Cheap plant based brushes will not flick properly. After some time of using them you will find the bristles bent to one side, making it impossible to perform the flicking action. So invest in a good-quality dandy brush. How it’s done: Start behind the poll and brush the horse’s coat in the direction of it’s growth in a flicking motion in short strokes. This is a movement that resembles the type of sweeping you’d do with a corn broom. Remember, you are trying to bring up dirt and debris and distribute oils. See how the bristles of the brush in the picture flick elastically? That’s what you are looking for. Brush the whole horse this way on both sides. If desired, follow up with a second brushing with longer strokes, but still flicking. Your goal: bring up more dust, debris and dander from the horse’s skin up to the surface of the coat and distribute the oils on the skin over the hair coat. Important: This is where your regular rubber curry comes in! After every two or three strokes clean the flicking brush on the rubber curry. Every couple of times knock your rubber curry against the wall or ground and see the dirt fall out! You will not want this dirt to remain in your brush, otherwise you’ll just reapply it to your horse. When finished flicking, thoroughly sweep the brush against the rubber curry several times to clean the brush before putting it away. 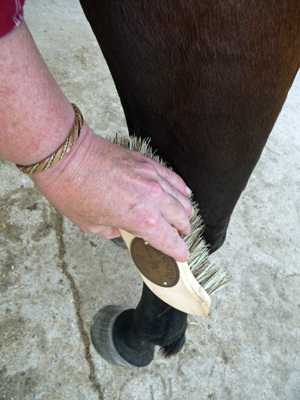 Make this a habit and you will keep your brush nice and your horse happy! After you thoroughly curried and ‘flicked’, you are now ready to brush off the dirt and debris you lifted to the surface with a good softer brush. 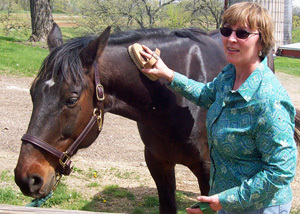 A real horse brush is a natural bristle brush with a high bristle density. These brushes are usually made of horse hair. 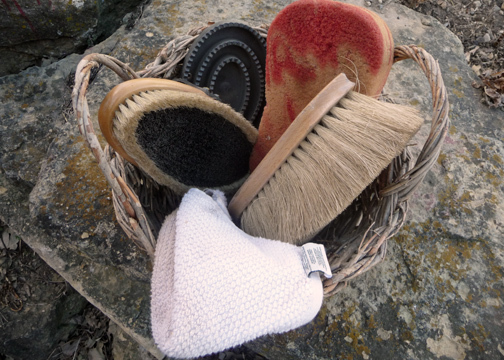 Cheap horse hair brushes are not only much too soft, too loose and not durable enough. Horse hair used to be a precious raw material and I think it should stay that way and not be treated as a ‘throw away’ material. Cheap brushes that need to be replaced often, also contribute to a ‘throw away’ attitude towards the animals that provide this precious material: horses. When I buy a horse hair brush I am aware that it comes from a horse and I want it to last for a very long time, not wanting to fuel a demand for horse hair. How it’s done: Move in the same direction as with the flicking brush, always with the direction of growth. Here you don’t need to flick, but work in even, long strokes to remove all surfaced dirt from the coat. Clean the brush against the rubber curry every couple of strokes! This is very important, you don’t want to reapply the dirt to a different area of your horse’s body. Give the horse a second brushing with this finishing brush, if needed. By now you should have a reasonably clean and good looking horse with some shine to it. You will now want to take it up a notch. My favorite tool to remove fine dust particles and smooth the hair is a soft, large goat hair brush, followed by a cloth diaper or a lambskin mitten such as the ones used for washing cars. How it’s done: Again, work in the direction of hair growth. Your goal is to move all fine dust off the surface of the horse’s coat and smoothen the hair flat. 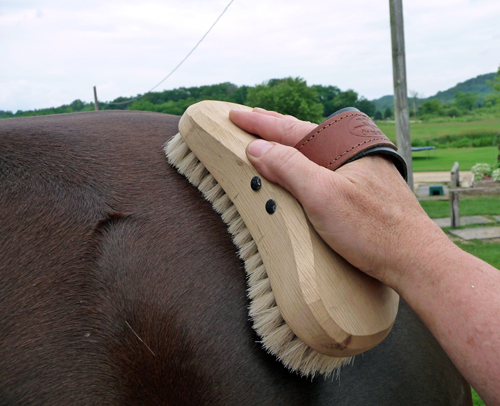 Brush the entire horse, several times if needed, with the goat hair brush. Then follow up by wiping with a good amount of pressure in the direction of hair growth, either with a cloth diaper or a lambskin mitten. Last Step: Stand Back and Enjoy! A note regarding face and legs: I use all steps on the face, except currying. I don’t know one horse that would mind being brushed in the face with a medium stiff brush, if you do it carefully, especially around eyes and muzzle and move with the direction of hair growth. On the legs, I don’t use a curry, but rather a stiff leg brush (NOT a synthetic material, which can be harsh and scratchy!). Your horse has a natural skin protectant, natural oils that keep his skin soft and moisturized, protected from micro organisms and the hair shiny. Don’t remove these oils by shampooing your horse just to reapply them artificially with moisturizers and shine sprays. Less is more. Nature provided all your horse needs. If you need your horse to shine and look his best for a show, for instance, make it a habit to groom him regularly and you will find it easy to create that extra shine before the show. Only shampoo mane and tail and hose off the horse’s body with clear water, if needed. One exception: It can be a good idea to shampoo your horse once in the spring to thoroughly wash out excess dirt. Be sure to use a natural horse shampoo that will be gentle to your horse’s skin. 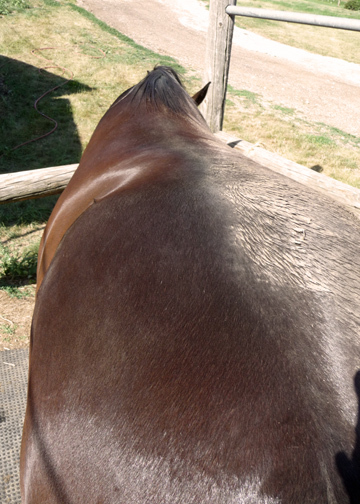 Note: It takes a few days of good grooming after each shampooing for your horse’s coat to shine again! Reason: The horse’s skin and coats was stripped of most of the natural oils. 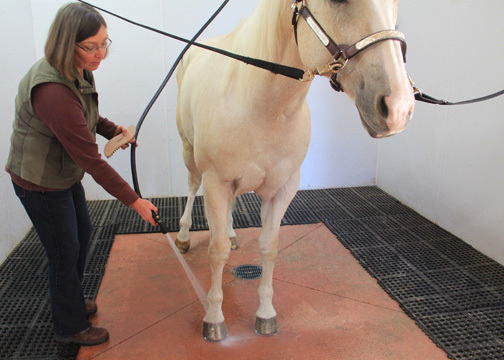 If preparing for a show or event, shampoo your horse 3-4 days before the event. After reading this article, you may suspect that I had suffered a fair amount of frustration with the grooming tools available in most tack stores. In my search for better brushes, I first came across some Swedish brushes, which were of much better quality than anything you could find here in the US at the time (2010). During a trip to Germany the following year, however, I went into a tack shop in Aachen, where I stumbled upon Leistner™ brushes. The quality is so exquisite that I decided to sell these brushes here in the US. Artisan brush makers since 1882, this company specializes in equine brushes and the products surpass any expectations. When comparing prices online you will notice that my prices are lower than the prices these brushes retail for in Europe. I’d simply like to make these brushes available to US horse lovers and hope you’ll love them as much as I do. Enjoy your horse and happy grooming!